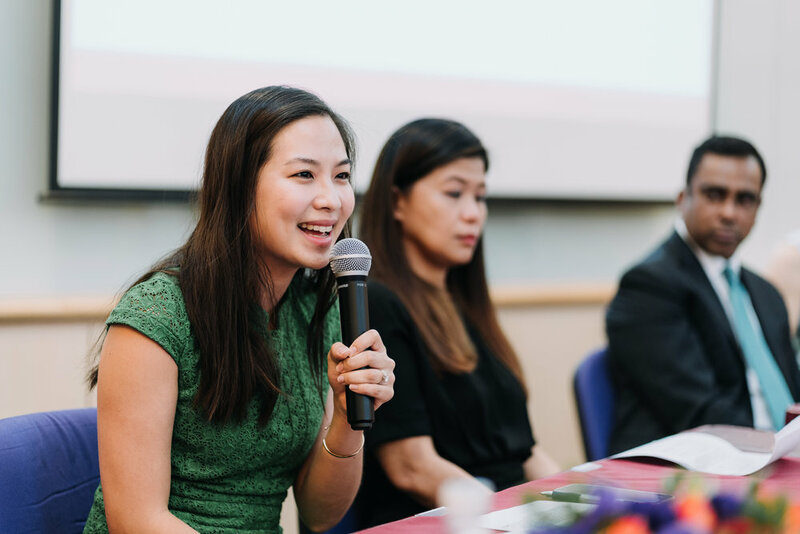 Founder of Blessings in a Bag, Emily Teng, shared her personal experiences and stories at the recent Press and Media conference for the President’s Volunteerism and Philanthropy Awards. “I have spent most of my life second-guessing myself and what I could share with the world. In 1997, I was growing up in Serangoon gardens, being raised by both parents with a younger sister. I recall a time where we had to line up late in the evening just to buy bread that was being marked down for sale or being excited to earn some money when the karang-guni* uncle honked his horn in our street. In 1998, I learned what it was like to be looked at as ‘different’ or as an ‘other’; I was one of the few Asian faces in an all-girls school in Australia - I knew how it felt to be sidelined and silenced through bullying and name calling, and what It felt like to only afford hand-me downs or shop at a thrift store, buying clothing that was two to three sizes larger so that we wouldn’t have to worry when I outgrew them and because I knew I could never afford what my peers had. In 2002, I remember experiencing the consequences of what happens when people intentionally choose to be unkind - if I was the same girl now that was I was back then, I would not be sitting here with you this morning because I suffered from anxiety, could not make eye contact when in conversation and didn’t really see the value in who I was. But in 2005, there was a turning point in my life. Someone believed in me and they reminded me of what they saw, even when I couldn’t see it for myself. From this shy, anxious, supposedly ‘worthless’ young girl - I was encouraged by the likes of media veterans, Mark Richmond and Daniel Ong who gave me an opportunity, and took a chance on me to discover my own voice and be able to use that influence for good. And that is why I know for sure that: everyone needs someone to believe in them. And that we need more people seeing the value in others. Everyone in this room, sitting here this morning, regardless of your background or upbringing, has had someone cheer them on in some shape or form - your parent, your teacher, a friend. And it could happen at any time; perhaps years ago, days ago. I had a recent experience, just in the last month of being championed and cheered on when the COO of Facebook, Sheryl Sandberg and Facebook teams personally told me that they believed in me and announced to the world, their commitment to journeying with me and 114 other community leaders from 46 countries. What it does to the human spirit to be believed in. And, it’s the same with our youth. We’ve had children attend every week without missing a beat since 2015 - and we know they keep coming back because of the friendships and relationships they have with each other and our volunteers. Almost every day, I’m reminded of all the stories of impact that have taken place through our community. One of them happened when I recently took a group to a global tech company. That's when I stepped in and shared that anything is possible in life and the fact that we're physically able to be here in the offices means she is (literally) closer to getting to where she sees herself one day. This same girl, who’s starting a work placement opportunity this week is the same girl who told me that she skipped school on a regular basis because she believed she did not have a future to be excited about. And that’s the power of believing in someone, of human connection and of strong relationships. We play cheerleaders to youth who may not have the experience of being cheered on at home, or at school or in the neighbourhood. And whether people are contributing their time with us, their skill sets, their financial gifts, we tell them: YOU ARE A CHEERLEADER. I’m grateful to be cheered on by the National Volunteer and Philanthropy Centre, PVPA and the giving community this morning and we’re so honoured and elated to receive this years award for Kampung Spirit - because I’m sincerely hoping that this will not only inspire but transform hearts of people to live out our community’s motto of: “Do what you can, with what you have, where you are.”…and most importantly, to do it with love. And I’m really hoping that this will start greater conversations as to how we can support young people with bold ideas for the Singapore of their dreams and how we can make it an easier choice so that people don’t have to choose between making a living and making a difference in the lives of others. *Cher: Local term used by students, shortened of the word, Teacher.